The sight of strings of wild Barnacle geese flying overhead, with a noisy chorus of honking, will be a familiar sight to many. 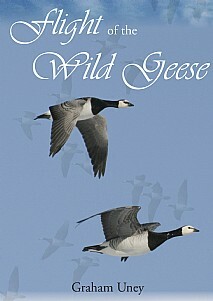 However, following their migration, little is known about the lives of these sociable geese. Flight of the Wild Geese tells the story of the winter wildlife of the Solway Firth, that wonderfully wild estuary set between the rugged hills of Cumbria and the rolling farmland, moors and forests of Dumfries and Galloway. It explores the links that these beautiful places share with the most remote islands of the North Atlantic, and with the stunning landscapes of the high Arctic. This is a book of birds, of people, and of places. The author's sea journey takes in a number of remote islands, beginning with the two Scottish outliers of North Rona and Sula Sgeir, then venturing ever northwards via the stunning rocky coasts of the Faroe Islands, the black-sand volcanics of Jan Mayen, and the great sea bird colonies of Bear Island before encountering pack ice in the vast sea channel of Storfjorden. Here, in Svalbard's Arctic waters, ivory gulls roamed the ice islands searching for food, while seals hunted the open flats between. Arctic wildlife filled every space, backed by an array of glistening snow peaks, their glaciers carving rivers of ice down to the sea. This was the author's first view of Svalbard - Kingdom of the Ice Bear. The author also reflects on his life as a writer, photographer and environmental surveyor. Growing up in the flatlands of East Yorkshire where his love of wildlife was instilled, he yearned to know more about where the winter-visiting birds went during the summer. He learnt a great deal about waders, ducks, geese and swans at the Humber Estuary but, once these birds had migrated to cooler climes in the summer, their lives were a mystery. Later in life and with the Solway Firth on his doorstep, where some of the largest numbers of geese are to be found, he decided to find out. This handsome book will be of immense appeal to all bird lovers, anyone with an interest in wildlife, the natural world and all those who enjoy travel books.